As technology changes, homes and businesses in Topeka are beginning to take advantage of wide range of advancements that makes it easier for things to be done in a timely manner. In addition to cutting down on the time that it takes to complete a specific type of task or project around the home or office, significant amounts of money can be saved too. One of the most important involves the process of making pipe line repairs, specifically those located under the ground. Fortunately, these new innovations have completely changed the way things are being done in the plumbing industry. So, for those of you who may be interested in knowing more about Sectional Point Repairs, specifically as it relates to the old traditional technology, here’s are few facts that you should know. First of all, before discussing the newest technologies in this industry, it is important that everyone knows what the old tradition processes consists of. For instance, the traditional pipe repair procedures are very labor intensive and time consuming. This is because any underground pipe repairs that needs to be performed usually involve hiring a crew of professionals in the industry to identify the problem so that they can make the repairs. Unfortunately, these sewer repair projects normally take quite a bit of time because it requires digging up the ground to see what is going. In some cases, the pipes may have burst due to wear and tear, or the pipes may be obstructed by large clogs. Whatever the case, it can take a significant amount of time and a crew of professionals to pinpoint what is occurring underground. Digging up the ground to find the pipe that is affected is not the only concern that everyone normally dreads when a excavation crew enters the property to dig up the property. Specifically, because the ground above the pipes cannot be removed without disturbing the landscape too. Meaning when this crew gets started, they may be required to dig up flowers, plants, trees, concrete driveways and any other things that’s in the way of getting to the problem. So, this older traditional method of repairing pipes have some inherent problems that people prefer to avoid including paying restoration cost. Unlike the traditional method of digging up the ground to get to the broken or clogged up pipes, people can benefit greatly from the latest most innovative method of repairing underground pipes, which is Sectional Point Repair technology. In fact, this newer technology has a wide range of benefits, and this is why it is increasingly becoming more popular over time. 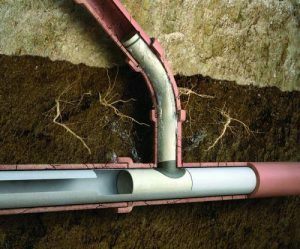 With this repair solution, the ground around the pipes does not have to be excavated to get to the root of the problem. Instead, Sectional Point Repair specialists can identify the issues with an over the ground solution that does not require digging, nor will it require destroying the landscape to get the job done right. Therefore, people will not only save time, but also money. Thanks to all of the benefits that this new technology offers, Sectional Points Repairs have become the best affordable and timely option for repairing pipelines today. Therefore, for those of you in the Topeka area who have a pipe line repair problem that needs to be resolved quickly and efficiently, please contact us for an appointment today.